Lonely Planet has named Oakland, CA one of the top ten U.S. travel destinations to visit on the "Best in the U.S. list for 2015. The compilation is published to highlight the best travel destinations in the U.S. for the upcoming year. Lonely Planet is the #1 selling guidebook publisher in the world and is proud to call Oakland home to one of their West Coast offices. Oakland is buzzing with energy from a thriving restaurant scene, diverse entertainment and arts offerings and a vibrant nightlife. Lonely Planet describes Oakland as an incubator for adventurous restaurants and spotlights Oaklands Art Murmur and First Fridays as a cant-miss cultural event. Visit Oakland CEO and President, Alison Best, says the accolade only confirms what people in Oakland already know about the destination as a treasure in the Bay Area. We are thrilled that Oakland was recognized as the only Bay Area destination to be handpicked by Lonely Planet and will now be on travelers lists of must-visit cities, Best remarks. Oakland is proud to be one of the most diverse cities in the country, with over 125 different languages spoken. It is also home to three professional sports teams, 108 thousand acres of scenic parks and trails, and Lake Merritt, a 3.1 mile urban lake located in the heart of downtown. ### ABOUT VISIT OAKLAND Visit Oakland is a non-profit organization marketing Oakland, CA as a travel destination. Visit Oakland offers a wide variety of complimentary services and materials for travelers and meeting planners interested in experiencing Oakland. For more information, visit visitoakland.org. About Lonely Planets Best in the U.S. List 2015s Best in the US list includes a mix of up-and-coming destinations, old faves with new highlights and places poised to shine. And we hope you like to eat and drink, because the whole country seems to be enjoying a local food renaissance. 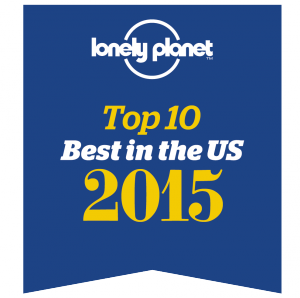 Visit lonelyplanet.com/best-in-the-us-2015.